Before the testing activities start, we need to have some goal in our mind so that we can achieve them. Product testing, product development both are time bound activities and we need to ensure that the activities should complete in time. And more time means more cost. So planning plays very important role to complete the activities in time. Test Plan is a documents which is plans all the testing related activities like when to start testing, when to stop testing, and roles and responsibility of each and every testing team member and many more things.it also tells us the effort needed to validate the software. So let’s look one by one each activities. Test Plan Identifier / ID : here something unique name is given to the test plan so that it will become easy to identify. And also version number. When there is some change made in test plan, version of test plan is also need to be changed. Introduction : here the description of the software is mentioned. The idea behind the software the domain to which software is related. 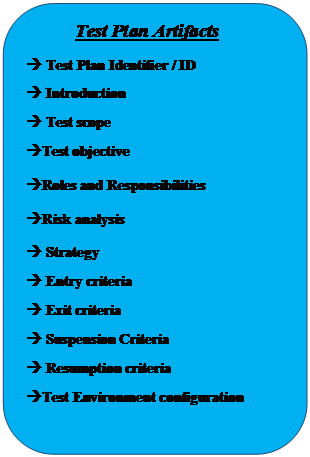 Test Objective : Here the guideline which is helpful for testing process is mentioned. Like testing strategies and the tools used for testing the software. Features to be tested : here always we tester need not to test each and every functionality of the application. Sometime some feature is not need to test now they may need to test in future but not now. Here the list of the feature, modules are provided so we only test these features and modules. Features not to be tested : here the features that is out of scope is mentioned here means the feature which we need not to test is mentioned here. Roles and Responsibilities : here description about the tester and their task is mentioned. So that each team member know what he has to do.it makes clear vision. Risk Analysis : Risk Analysis mean analyzing the future risks that may occur and effect on testing activities.in simple word, while testing which problems can occurs and how to face if any particular problem is occurred. But it is not necessary that the problem will occur. It’s just a probability. 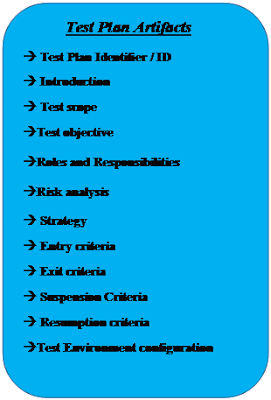 Test Strategy : Here which type of testing need to be performed is mentioned here. Like which method is need to be used to test this particular software whether it should be Black box testing or white box testing or a combination testing required. Which level of testing is required like unit, integration or system etc. this depends on software completion. If software is partially completed then integration testing in performed and if full software is ready then system testing is performed.Other thing mentioned here is how many number of test execution cycles need to be executed and data collection and creation. Entry Criteria : When to start the testing is mentioned here, like when the test data , test cases and test environment and software under test is ready then we can start the testing. such a condition is mentioned here. Exit Criteria : When testing need to be stop is mentioned here. Like when all the test cases is executed. Such a condition is mentioned here. Suspension Criteria : when a major bug is found and because of that bug further testing can’t be continued then testing activity need to be stopped. so such a suspension criteria are mentioned here. Resumption Criteria : Here after Suspension of Testing when we need to resume testing is mentioned here. For example, if testing is suspended because of the major bug was found while testing then Resumption Criteria will be, Testing can start after fixing of the major bug. In short when all the suspension criteria are resolved then we can continue with testing process. Test Environment : the Hardware and Software requirement of the software under test is mentioned here. These are the fields in the Test Plan. You may find some more field or some less field, this fields vary organization to organizations.